Bus from KLIA to Melaka or bus from KLIA2 to Melaka is one of the highly popular bus services in both KLIA and KLIA2 airport. Many foreign tourists landing at KLIA and KLIA2 airports prefer to go straight to Melaka to visit the famous historical city. Hence, buses from KLIA/KLIA2 to Melaka, provided by Transnasional and Starmart, offer great convenience to foreign tourists. Starmart Express and Transnasional are the only operators serving buses from KLIA/KLIA2 to Melaka. Both are reputable bus companies well known for their comfortable buses and efficient services. The fare for the bus from KLIA/KLIA2 to Melaka ranges from RM 24.10 to RM 35.00. There are a total of 32 schedules daily for the bus from KLIA to Melaka or bus from KLIA2 to Melaka. After landing and undergoing customs clearance, foreign tourists can proceed to the KLIA coach bay and KLIA2 coach bay for checking in and boarding. The earliest departure is at 6:10am in the morning and the latest departure is at 12:15am at midnight. Please note that bus departures for the afternoon session only begins at 1:15pm. The travel duration for bus from KLIA to Melaka or bus from KLIA2 to Melaka is about 2.5 to 3 hours depending on traffic condition. Coaches will travel directly from KLIA then to KLIA2, before heading to Melaka Sentral Bus Terminal or Malacca Mahkota Medical Centre arrival points. Why Take a Bus From KLIA/KLIA2 to Melaka? 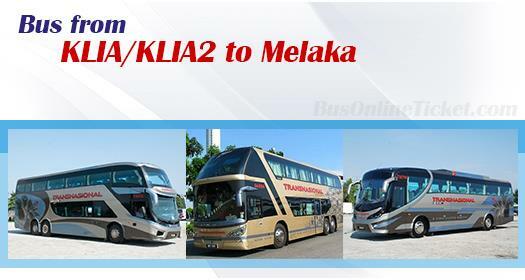 This direct bus service from KLIA/KLIA2 to Melaka is convenient because passengers do not need to take a shuttle bus to Kuala Lumpur TBS from KLIA and KLIA2 airports, then transfer to another bus from KL to Melaka to get to Melaka. Hence, even if the bus fare for bus from KLIA/KLIA2 to Melaka is almost double the bus fare from KL to Melaka (which is around RM 10.00 to RM 18.00), it does not stop foreign tourists or locals from taking this convenient and direct bus service from KLIA/KLIA2 to Melaka. It is always safer to book the ticket online in advance at BusOnlineTicket.com to avoid disappointment. BusOnlineTicket.com accepts foreign credit card and Paypal which makes booking easier for foreign tourists coming to Melaka.